Welcome to the St Nicholas’ Chantry CE Primary School's website. Whether you are looking for an introduction to our school, up to date information or just like to see what we are doing we hope these pages will give you what you need. We are a Church of England Primary School that currently caters for 394 children in the town of Clevedon, North Somerset in the UK. We have recently increased our potential capacity and can now accommodate 420 children. If you would like to know more please do not hesitate to get in touch. At St Nicholas' Chantry CE School we want our children to be curious life-long learners who can work collaboratively and achieve their full potential. English and Maths follow the Nation Curriculum and where opportunities arise cross curricular links are used to enhance learning. We have devised a Curriculum that has the flexibility to optimise new learning opportunities that may present themselves. This enables us to provide our children with engaging learning experiences, that excites their imagination and challenges them. Creativity is at the heart of our children’s journey of learning. We endeavour to provide a rich and diverse curriculum, linked to the real world, teaching children important key skills, attitudes, and a love of learning which encourages children to think outside the box. The teaching and learning at our school is of a high standard and is well planned and managed so that every child is supported and challenged. 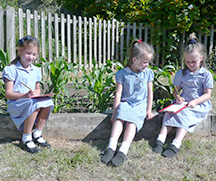 We enable children to take an active part in their own learning. We believe that pupils must understand what and why of their learning, where they are in relation to their learning and it is vital that they can explain what it is that they have achieved. Our Curriculum is outward looking and embraces our wider community. We engage with parents, industry, local organisations and individuals to bring the real world into our school. We offer our children a global dimension to their learning through our links with schools in Nepal and Uganda. All these links and aspects of our curriculum that we have developed and build on, are designed to enrich our children’s understanding of the world. Our curriculum also takes out in to our local community and enhances our children’s social emotional development, as well as promoting oracy skills and offering children depth and breadth of understanding. We want our children to realise, through our curriculum, that they can impact positively on their world. As a school we want the richest and diverse curriculum. Children are able to access a wide range of sporting activities, many exciting STEM (Science, Technology, Engineering, Maths) activities and our extensive grounds offer great outdoor learning opportunities. Music also features prominently within our curriculum. We offer two camp activities and our schools trips encompass an array of opportunities. We believe too we have created a Curriculum that is fully inclusive and designed to challenge fixed mind sets and ensures we offer a unique and broad range of experiences. We ensure that we review our provision annually, as we endeavour to provide all our children with skills and knowledge needed to lead fulfilling lives, where they can engage as active local and global citizens. St Nicholas Chantry Primary School is part of the Clevedon Learning Trust; a Multi Academy Trust formed on 1st January 2015. The Trust is made up from school clusters in the Clevedon and Bridgwater localities. As a Trust we understand the value of a school-led education system and our role in partnerships with other schools. Our principles are based on our collective responsibility to children in ours and the wider community. The Trust was formed with a shared vision to provide and support high-quality inclusive education that is student-focused and achieves excellent outcomes. The Clevedon Learning Trust is able to provide an inspiring and coherent education from age 4 to age 18.